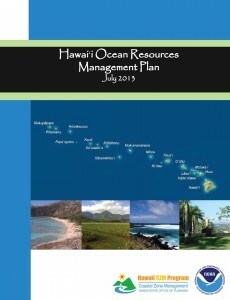 The Hawaiʻi Ocean Resources Management Plan (ORMP) is a statewide plan that sets forth the State’s ocean and coastal resource management priorities. The ORMP supports effective management, beneficial use, protection, and development of the state’s coastal zone, which includes all lands of the state and the area extending seaward from the shoreline to the limit of the State’s police power and management authority, including the U.S. territorial sea. The ORMP is a requirement under Hawaii Revised Statutes §205A-62(1) and is a major component of the State’s Coastal Zone Management (CZM) Program. A partnership of State and county agencies has been collaborating since 1985 to improve the management of Hawaii’s ocean and coastal resources. Today, through the Council on Ocean Resources whose membership includes directors of state and county agencies, with unanimous support of federal and community partners, coordinate and implement the State’s shared ocean and coastal resource management priorities. The ORMP was updated in July of 2013, and continues a place-based approach to management of ocean resources in the islands, based on recognition of the ecological connections between the land and sea, the link between human activities and its impacts on the environment, and the need for improved collaboration and stewardship in natural resources governance. The ORMP works by identifying eleven Management Priorities for the next five-year planning period, by identifying responsible agencies and resources, and by providing a method for performance measures and reporting.